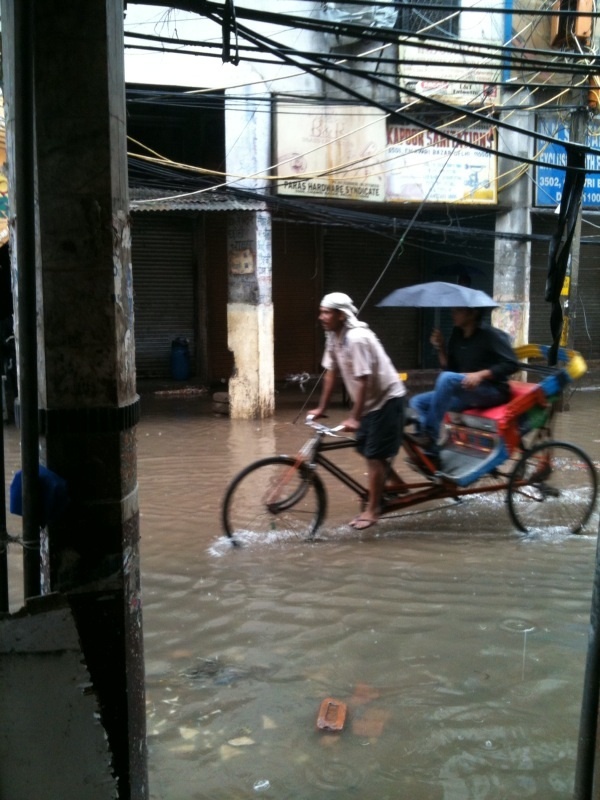 This year’s monsoon is truly never-ending and I’m Scottish – I have no romantic attachment to rain! We were instantly drenched and wading through pond-sized puddles but we soon met a man who made it all worthwhile. 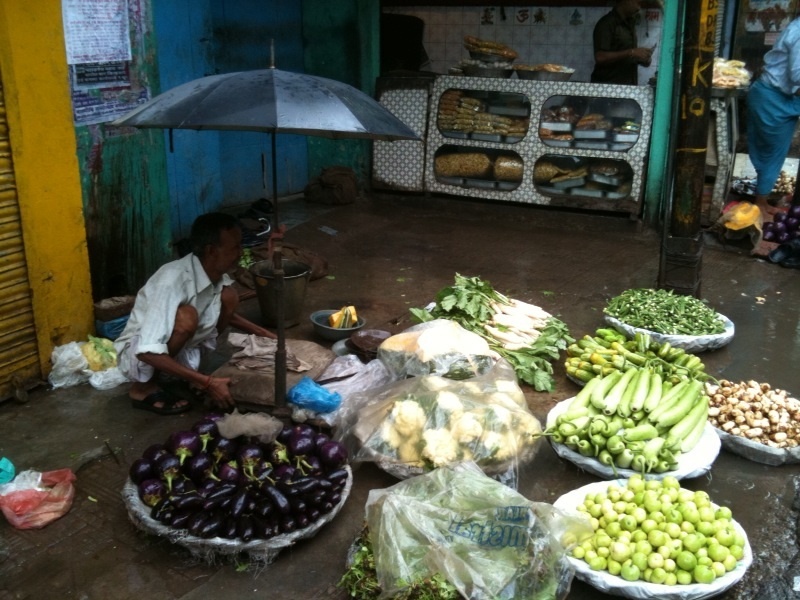 We’d arrived, for once, with no particular plan in mind but decided to check out the breakfast fare in Sitaram Bazaar. We asked around for recommendations and were pointed in the direction of Ram Swaroop. This is Anil Kumar, current owner of Ram Swaroop, named after his father, a shop which has been serving up mean breakfasts in the old city for over 70 years. 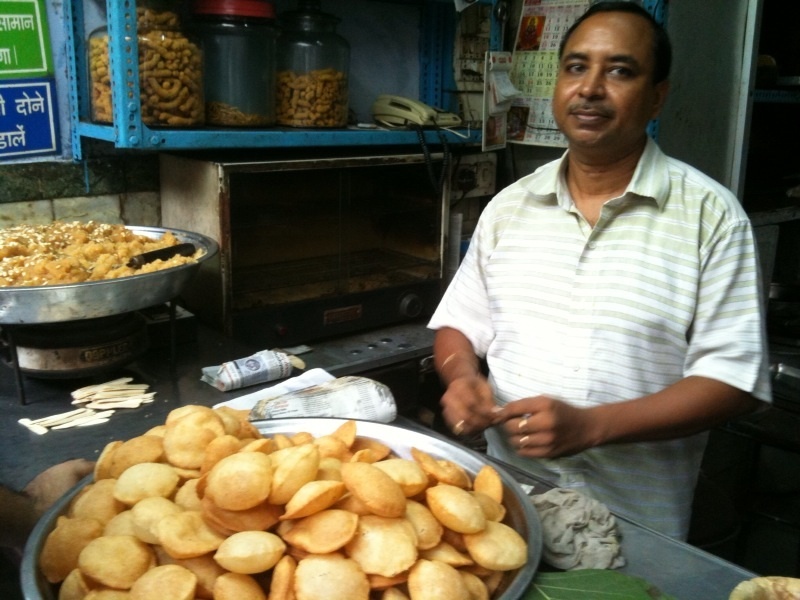 In front of him in the picture is a pile of Nagori – crispy fried poori made from semolina, white flour and ghee. This is served with a warm, not too sweet, not too sickly semolina halwa, to the left of the picture. We also ordered plates of Bedmi Aloo; both dishes were exceptional and complemented each other fabulously. The savoury potato, cooked in its skin, laced with coriander, cumin, chilli powder and hing with its perfect bedmi for dunking and scooping; then the crumbling crispness of the nagori and soothing sweetness of the halwa. Now that I’m only 20 minutes away Mr Kumar is going to be seeing a lot of me in the coming months. 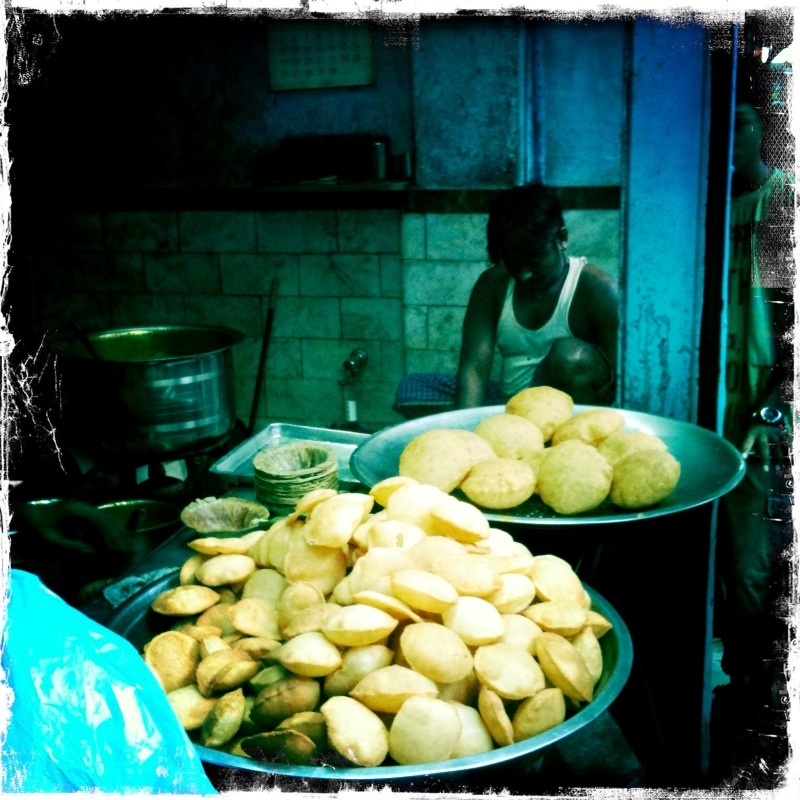 Mr Kumar himself was a gent, even sharing the recipe for his sensational nagori. The dough is made of 2 parts sooji (semolina) to one part maida (white flour). For every 1kg of dough, add 200g of ghee. Then fry to melting crispness. I was longing to eat the whole thing all over again almost as soon as I’d devoured it. Always a good sign but on this occasion we had more breakfasts to try…….but that will have to be another post. Before you go, though, look at these two…. Aren’t they gorgeous? We spotted them outside Chaina Ram sweet shop in the Fatehpuri area. 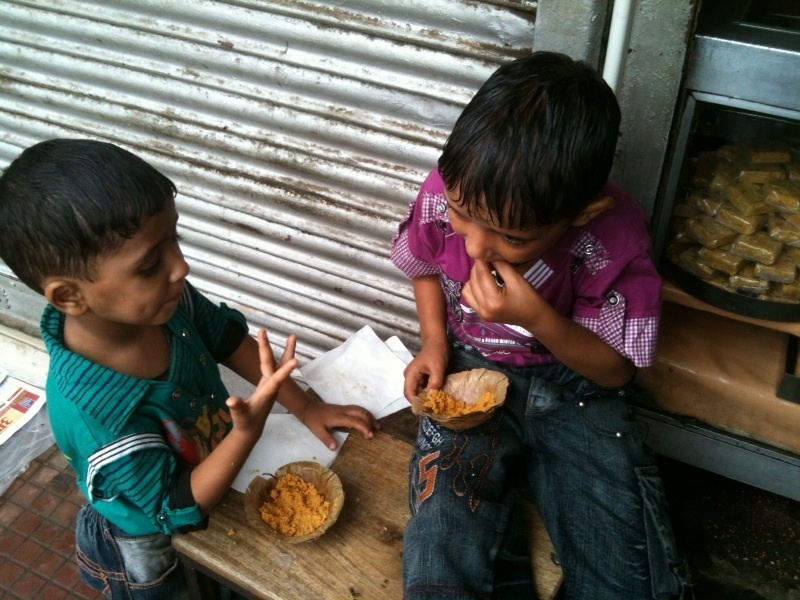 The rain was lashing down but they were oblivious as they devoured a crumbled laddoo – a moreish golf ball-sized sweet made from besan or semolina. Hi Pamela..I have never had Nagori before but your delicious description is making me hungry!Lovely post and looking forward to more on the Delhi’s delicious street food! Glad you’re back Pamela…with the Metro now able to whiz me, too, straight into Old Delhi, I need as many of your tips as I can get for street food excursions! You are back , believe me i have been missing you Pamella. I can imagine it must have been a beautiful experience with the breakfast after braving the puddles. This particular season of rain has busted all the romantic sentiments about rain and all Dehliites are miffed with it i am sure. 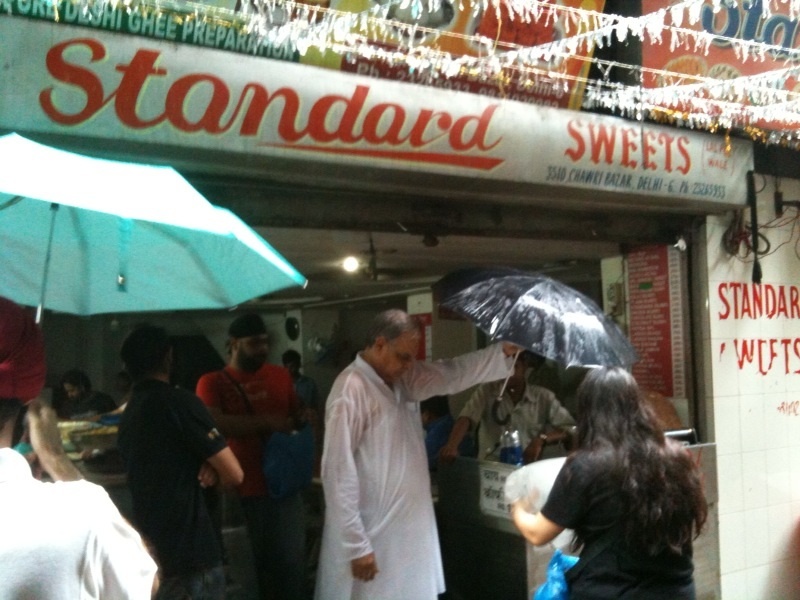 Nagori n halwa sounds great and if it is so dirt cheap i wonder how do they manage it …. post the next episode soon… loved the younger child in the pic who is ready to lick his fingers.. Oops..I was skeptical n so jz Confirmed..You ve already been to Shyam Sweets!! The other day I was wondering what is missing in my cyber being. Today it dawned that it were your mmmmm delicious posts. Hi Narender – Thank you so much I’ve been really useless the last few weeks – I’ll try not to let it slip again! I plan to eat enough for both of us! Supratim – who could begrudge them – they were relishing every crumb! Thanks Tennille – give me a shout when you’re planning an Old Delhi trip, I’m always game! Hi Madhuli – nagori was new to me, and several others too, but I have a feeling it’s going to be a regular from now on! You remind me and make me nostalgic about the years I spent in Delhi…Do try the kebabs and other street foods in Old Delhi. Will look forward to coming back to your Blog. (Arrived from Finely Chopped).